Your 2009 Gaming Resolutions- how did you do? Empire- Raid- Orcs + 260gp!!! 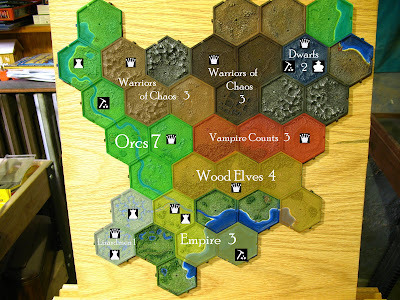 There only three unoccupied hexes left on the map after 3 rounds! John bought 1 EP with gold from the Orc Raid had somehow overlooked he already built the fishery week 2, so screwed himself out of 2d6 X10 gp...he use the extra EP to upgrade to a castle. please post them on the forum..
Ok guys, hoping to see alot more of these out in the blog community, I posted my results for 2009, here are my resolutions for 2010. I'm going to keep expectations lower this year as I only managed 4/10 for 2009, I hope you all did better. Here's my wish list for 2010 in order from the seeming easiest to most difficult to accomplish! a couple weeks..if I just sit down and do it. This is my primary terrain project for 2010..and I am going to try very hard to limit myself to getting this done this year. 2009 was good year for miniatures gaming, with me personally and for the hobby as whole, while it had its up and downs. Public gaming seems on the rise and I am finding more and more people of all stripes interested in hobby. I just wanted to note my personal reflections on my own doings as well as my reflections on the larger goings on. Admittedly I was short in the discipline department this year, while I'm sure alot of it had to do with stress from my business, which is again- odd, as toiling away in the basement is my primary stress reliever. Either way no regrets on anything I did or didn't do on the hobby front in 09'. I played more than ever in 2009, almost on a weekly basis and with the half dozen tournaments I prepared for and played, it probably averaged out to a couple games a week. Most of this was Warhammer Fantasy, but I got a good number of Lord of the Ring and Legend of High Seas games in with a few others in here and there..even a session of board games or two. Playing more is definitely great..hosting my own club night at my place has been great too..we dont always get the best turnout (like we did at the store) but it's created a great venue for a bunch of us to play more and that's always a good thing. Again the blog had a great year, I doubled my daily views and broke 100k hits in 2009. Wargaming blogs have really exploded in 2009, places like Bell of Lost souls and From the Warp..are great sources of information. I don't try to do what those guys do. Plastic Legions is primarily about my own hobby pursuits and interests..I wish I could offer more content, like Ron does or even a constant steam of info to the news feed like the crew at BoLS does..but I just don't have time. While sometimes I even get privy to advanced GW info, it just not worth posting because of the flak you take from idiots. As a result alot of my Blog is personal reference for me and my pals, but please continue to expect as much news as I can post as well as my personal hobby updates on various projects and coverage of my favorite events. I look back at the Blog in 2009, and think well I wish I got this or that posted or maybe a tutorial..so it's definitely my goal to provide the best content I can. Looking back on 2009 it look liked a great year for wargaming.Games Workshops continual dominance of the industry with their constant approach to recruit new players seems to be working well. The combination of constant new product and licensing deals with its IP's to video games and now movies seems more successful than ever. I'm as excited as the next guy to see what they put out this year. Even more exciting however is the success of the other manufactures putting quality low cost plastic models as more business try to compete for GW's dollars..this ups the ante for GW in the product department..competition is a good thing. Overall gaming is one area where I look back at 2009 with some trepidation. While Tournaments seem more attended than ever, GW's pulling out of direct involvement in now all but one yearly public event just doesn't sit well. Regionally there are many different opinions on what makes a good event and what doesn't. Unfortunately I see a pretty big cross section of players trying to move public events away from traditional hobbyists type events over to straight gamers or even power gamers who want to game for cash/prizes at the expense of the hobby. Obviously if you read anything I wrote this year you know I dont see this a good thing. This problem is exacerbated by a really poor set of Indy GT rules which means it's the wild west out there for 09-10' when it comes to events. Players just need to pick and choose what they want in an event and attend what works for them and if nothing does just host your own. All this choice is by no means a bad thing, but GW's involvement in a standard set of GT rules for independent tournaments that actually promoted it's 20+ years of focus on the hobby would be a better thing. Blogging was huge in 2009, I expect the same thing year. having this kind of public communication about the hobby worldwide is something we shouldn't take for granted, especially when most would have figured it as fantasy as recently as 5 years ago. I got turned on to a ton of great blogs this year, I hope to get meet or even play with some of you this at Adepticon!...anyway, just some random thoughts..Happy New Year people!. 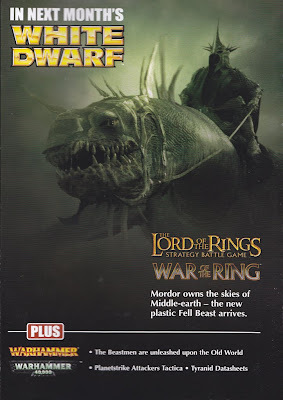 In what seems to be a rarity these days WotR, & LotR's is getting its first plastic kit since the Ent earlier in the year, White Dwarf 360 arrived today and while its packed full of Tyranids, Legion of Damned and custom built outposts..that back cover talks about the Beastmen preview and the New Fell Beast plastic kit, Any big dragony thing with wings will definitely be a great kit for conversion possibilities! Well its the week before Christmas so there is not much point in delaying the inevitable follow up to my post last year about Gaming Resolutions. If you took part in this examination of your own self discipline..tell me how you did!, After Christmas I'll follow up with a new set for 2010. No brainer or not, I broke this one big time, with the Release of War of the Ring (which I bought the rulebook and lots of new models and movement trays for) and Space Hulk, Since I only played two games of War of the Ring this year and I played two missions from Space Hulk..the cost vs return on both of these is pretty much a failure..although I will definitely play more Space Hulk. I should mention I did play some Blood Bowl too, and while I havent bought the core game and made my team out of existing stuff, its still a new game!! Yay!..I succeed here big time, with Special Characters I can push the 5K envelope with Empire, I definitely have 4K fully painted to my standard..with few models waiting for paint, I have two guys on the bench getting done this week! Result #9 - Epic Success!! Meh...I still didn't get thru painting the rank and file troops I wanted to finish up for this. I did get some new Daemon Models, like my FW Great Unclean One..whose 95% done (pictures soon) but overall..I can't meet my own criteria here, so I have to call this one a minor failure..besides with exception of a 1000 point tourney I played in,I played all of maybe 3 games with DoC this year. So sure I have 2250 with options playable for DoC good looking is another story. Definitely played alot more LotR SBG, While I didn't get my Mordor painted to 750 (its only at 600) but I did get an entire other Army, my Grey Company, completed to 350 plus display base. and it even won a Best Appearance award at a local event so I'll have to call this one a success! Edit..although I did play a couple games! LMAO!! another Epic Fail!!!!. havent touched a thing! Ok, I am sensing a pattern here, I didn none of the above although I did get rid of 90% of my Dwarf stuff, I did Start both Lizardmen and Warriors of Chaos thou...so its not a total failure,- just a failure of the above armys..still its a fail. Ok, Ok, ridiculous I even proposed it...an abject and total failure...I've crossed 40K off my list of things I am likely to play period, unless you want to count Space Hulk. It didn't happen, I wont keep pretending its going to. Result # 2- Epic Fail!!! Believe it or not despite my record of failure for easier tasks, I am calling this one a success. While I did buy new Terrain this year, and yes before I finished what I had backlogged. I did manage to assemble and paint just above every piece of the new and backlogged stuff I had through out the course of the year. While Its not all painted to what would be final but its usable. While I still have things like my Hirst City tiles for my Osgiliath Table to do..they don't count as me buying anything new..in end I currently have 5 tables in my basement and a ton of terrain! If you include my Realm of Battle table, and all the terrain I got done for Historicals I cranked out a ton of terrain this year! In the end I only accomplished 4 out 10 of my Resolutions successfully..there's a bit of an argument between success and failure on #8, and #1..but basing these on my own criteria splitting 50/50 is fair..still a 40% success rate isn't winning me any awards...hope you guys did better!. coming soon, Reflections on 2009, and Resolutions for 2010! 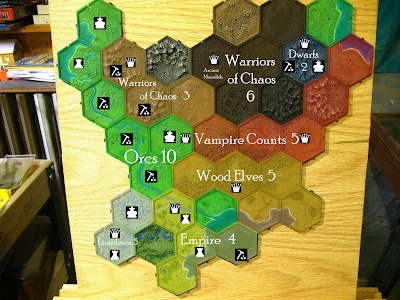 Dem' Orcs is dominatin! Round 3 is 12/29!!! I thought a solid Empire list for a No Comp environment @1999, Each game had unique scenarios, honestly the scenarios weren't doing much for me this time the second on particularly was just too out of the norm and made a hard game harder. As usual I'll add my personal scoring on the event based on Fun, my opponents sportsmanship, and if they brought a list that appropriate for the event. Marty brought a horde of new rats with the center piece being 41 Plague Monks and the Plague Furnace, lots of Poison gas going on all around. First time playing the new Skaven, there was alot of rules explaining going on, Marty's having none of exploitive rules nonsense that GW let get by with slopping editing in the new book, he's playing it 100% RAI (Rules as Interpreted) based on his 20+ years playing the game and for that I was thankful. Game started out ok...I rammed the tank out and made him deal with it, It made some rats run off, then it got charged by the Censer Bearers, Ate them up and them the Frenzy Plague furnace had to charge on the flank exposing its Flank and Rear to my Command Block and Flagellants, that was all good. The bad was we both misfired like crazy, I roll one first thing, meaning no cannon until turn 3, he has 3 or 4 misfires with his weapons teams. I lose a full block of Swordsmen and Warrior Priest charging a bunch of Clan Rats..(he had the new Skaven Battle Standard that does 2d6 X attacks) that caught me off guard..while I won the straight up combat (I'd of better!) good dice on the extra attacks pushed the combat his way, and I break... (Battle Standard where are you?) outside of that things pretty much went my way...except I was stupidly allowing the Stank to take wounds from failed toughness tests (Stank passes all characteristic tests, expect initiative) it was already nerfed by some other wounds at that point and was just holding the combat anyway.. Turn time limit was 2 hours and with all that was going on, we just ran out of time...we only finished 4 turns and being the game deciding combat was locked up..the game was a DRAW, the difference was only around 60 points, As the bulk of his points were in that unit, he only had 1 unit of Clan Rats and 1 unit of Slaves and a few other lose/broken units left...I am 90% confident I had this if the game played out in full..we'll find out as we are going to play it again for fun sometime soon. All in all great game..my favorite of the day. I did also get the bonus points for this round. This was I believe the 4th time I have come up against Bryan in a tournament, he is an excellent player most always in the top 5 of any event he's in and playing High Elves!. Unfortunately for me I cant seem to catch a break playing him, He's beat me to paste to about every game we've played and this one was no exception. Compounding the issue was scenario, we setting up and playing lengthwise with 24" deep Deployment zones and 24" inched in the middle as the no mans land. It was supposed to be rocky valley with the no mans land being a deep ravine, so if you were had a unit that was within 6 inches of a long table edge you had to roll a die for that unit on a 4+ you take 2D6 Strength 4 hits from falling rocks..an added and unnecessary complication given the bonus objective was to get your units into you opponents back field which on this layout was an extra foot away!. I got first turn, my Cannon shoots on his 2 bolt throwers with a 50 inch guess I about 8 inches away..I roll a "10" nailing it. I then of course roll a "1" to wound. That was the harbinger of the game, the next turn that same bolt thrower shoots the Steam Tank and puts THREE wounds on it. His Bolt Throwers absolutely shredded me, ripping up the Stank, and all my Cav, I couldn't hit the broad side of barn with any shooting. It was all down hill from there, every single thing that could have went wrong for me did (exception I held alot of losing combats sticking on 6's and 7's) in the end all my stuff broke, Bryan got full points. I finally get to play James Wappel, and his awesome Lizardmen. All thoughts of me winning any Best Appearance awards went out the window as soon as James started playing out early this year. Every single unit in his Lizardman Army is a Golden Daemon runner up, I must mention that most of this army is also scratch built or converted on top of the exceptional paint!. As expected, James won Best Appearance this day with myself or Mr Hodge being a distant second (there were six players getting full appearance scores (there was a 4 point swing for conversions versus painting) So it was still highest battle points + highest appearance score getting the award..So James had to win some games to get it and he did, So deservedly so. This Scenario had a wacky deployment scheme that made you roll to see in what portion of your deployment zone you got stuck in, again it just made the game more difficult which was I guess the point. Our game was fun one but again, "luck" I was having no part of. First turn I hit Stegadon/ Engine #1 with a Cannonball, a 1-4 hitting the Stegadon and potentially doing up to 6 wounds, I roll a '5" (worst outcome as "6" hits the priest) I do wound but it being on the crew, I only kill one guy. James quickly got both Stegadons behing Trees, until he could get one of his two units of Terradons on my Cannon, I managed to kill one but the other got it...considering I had one more chance to shoot the cannon and I misfired...I was lost any Chance to kill the Stegs. The Steam Tank and my Command Block ate one of his 3 units of 14 Skinks /2 Krox but chasing brought me in Range of Steg 1 and "Burning Alignment" on both my Inner Circle Knights on the left and the Stank on the right..KILLED me...he put 9 wounds on the Stank, 8 were from "Burning Alignment" where he needed "6's" to wound. My Inner Circle knights just popped first time they got hit with it. In the end James was up on me by around +460, at 1999 that's a Solid Victory he also got the bonus points..(highest value unit, Inner Circle Knights, his was one of the Steg/Engines. Good Game. I am signed up for another tourney next weekend..I am scheduled to bring my Daemons for the 1st time in a 2250 in public yet..we'll see how it goes. Great first night of the new campaign, my opponent got delayed do to work and we had to schedule for next week...you can see on the map what been updated so far, round 1 will be complete soon!. Round 2 is Tuesday 12/15!